​As we mentioned in our last post about deafness in our poochy pals, there is conduction deafness where the sound wave is impaired by some form of obstruction. There is also a type of deafness that happens when there is a sensor/nerve issue. This latter type of deafness is called Sensorineural deafness. Interestingly, it can be congenital or acquired throughout life. Congenital sensorineural deafness means you are born with a problem that will cause deafness. What’s interesting is that studies have shown hearing is often present in affected dogs in the first few weeks of life but is gone by the age of about 60 days! This form of deafness affects the cochlear duct (the part in the inner ear where the fluid meets the hairs that are attached to the nerve endings). Albinotic form – can occur in animals that are partially or completely albino, the deafness can be one side or both sides. Abiotrophic form – means degeneration or loss of function of the hair cells deep inside the inner ear that are supposed to translate the message from fluid wave movement to nerve impulses. Usually both sides are affected. Although normally deaf by 8 wks of age, there is the rare occasion where this may occur later in life. Acquired sensorineural deafness – occurs most commonly secondary to infections that cause inflammation of the middle ear and inner ear. Cancers can cause this problem but it is rarely seen. Meningitis can also be a component. Some drugs can cause problems if they get direct access to the middle ear via a ruptured ear drum, even some ear cleaners cause this if the ear drum is ruptured. There are also some chemotherapy drugs that may cause deafness. We can also see age related degeneration of the hair cells deep within the ear that will cause deafness. In the previous comments about hearing we focused on the ear and how amazing it is. 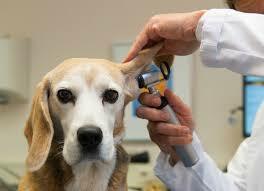 When we find deafness in a dog, it is most commonly a peripheral component in the ear that has malfunctioned. For a central lesion (brain lesion) to cause deafness there must be extensive damage present within the brain. We would expect to see severe neurologic signs if a dog has a central lesion big enough to cause deafness. This is rarely seen. But what about the rest of the dogs. Deafness is not that uncommon. So, what’s happening with everyone else? Conduction deafness and Sensorineural deafness. Today we’ll briefly touch on conduction deafness. Conduction deafness results from any obstruction to the passage of sounds waves from the external environment to the last part of the inner ear (spiral canals). The most common causes of this is in dogs are inflammatory lesions and growths. We also occasionally see it in dogs with chronic ear infections where the skin is so thickened they have a tiny ear canal that is full of wax and debri’s. How many times have you treated your dog’s ear infections (when both ears are affected) only to discover your dog can’t hear you! Their ear is full of ointment and this is a form of conduction deafness, albeit temporary as the hearing should return once all the ointment is removed and the ear swelling improves. Old dogs also get conduction deafness but the exact reason is still being proven. Prominent Veterinary Neurologists believe it may be arthrosis (arthritis) of the little bones in the ears preventing normal movement and conduction of the sound wave or a form of sensorineural deafness. Your dog's hearing is amazing! 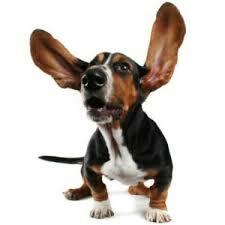 Did you know a dog can hear frequencies of 2-47 Hertz while we can only heart 1-19Hertz. That’s why they hear that visitor arriving at the door and we’re left wondering how! Hearing is an amazing thing! Perception of sound has been shown to start as early as 10-11 days in puppies, with development of normal hearing of environmental sounds in dogs by 4-5 weeks of age. The most amazing thing about hearing is the way we receive it and we completely take it for granted! Did you know the sound wave passes into the ear canal (external ear canal), hits a membrane (the tympanic membrane) which has three little bones on the other side (ossicles) inside the middle ear. Those little bones pass the message to the inner ear which is full of a fluid substance called perilymph. The sound waves move through the fluid and into little spiral canals, that are covered in hairs. Those little hairs (called stereocilia) vary in length and position along the canals. The hairs bending causes a nerve impulse to be sent via nerves. And that’s just the bit inside the ear! 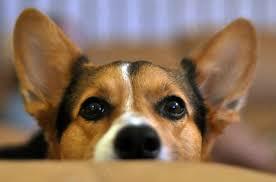 There are also the nerves and receptors in the brain that allow the dogs and us to interpret what we heard. Amazing! So much has been happening we haven't had a chance to say much lately! On a more serious note, Diesel has asked me to share the file below about toxicity and dogs. At this time of year vets see an influx of patients being poisoned. I’ve seen dogs that ate entire boxes of chocolate roses, lovely chocolate coated macadamia nuts, toxicity from roasted onions, dogs that swallow dropped human medications, burns from sausages stolen before they cooled down and pancreatitis from those trimmings that are too unhealthy for us to eat but seem to commonly be thrown to the dog! The most common at this time of year, is dogs stealing chocolates from under the Christmas tree. Diesel has been talking to dogs at the park and it seems this year is no different. They’re eyeing them up and waiting for everyone to go to bed before they help themselves to a midnight snack. Let’s make sure the present goes to the person it’s supposed to and keep the chocolates out of reach then we can all enjoy summer and not end up in hospital with our pooches.